The Southwest Michigan Water�Partnership is a coalition of municipalities that are working together to educate Southwest Michigan residents about protecting water quality and reducing water pollution.� To better protect water quality, greater participation is needed in Southwest Michigan.� All counties, cities, villages, townships, businesses and organizations are invited to join the Southwest Michigan Water�Partnership. The Berrien and Cass County NPDES-MS4 Group is comprised of the municipalities and counties that�are in the MS4 program to reduce�pollutants to surface waters of the State.�Their permits require these municipalities to conduct public education,�test stormwater outfalls for pollutants and perform pollution prevention activities.� Below you will find the Public Education Plan and the meeting agendas and minutes from this group. Municipal Storm Water Training Video is available to use. Remember to document all training of staff. You can use this sign-in sheet. A spoof on the typical boring training video, this piece was developed for the parks and public works folks that mow lawns, rake leaves, and keep property clean. In eight short minutes, the video stresses a few basic things employees can do to keep local streams and rivers clean. For additional water quality training videos click here! 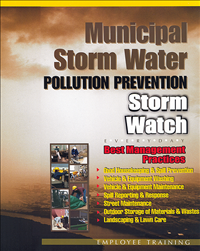 Through the Public Education Program of the Phase II Storm-water Program, SWMPC has developed several fact sheets, news articles and other items that can be utilized.